Self-Portrait as Blackie set of 3 prints has SOLD OUT! 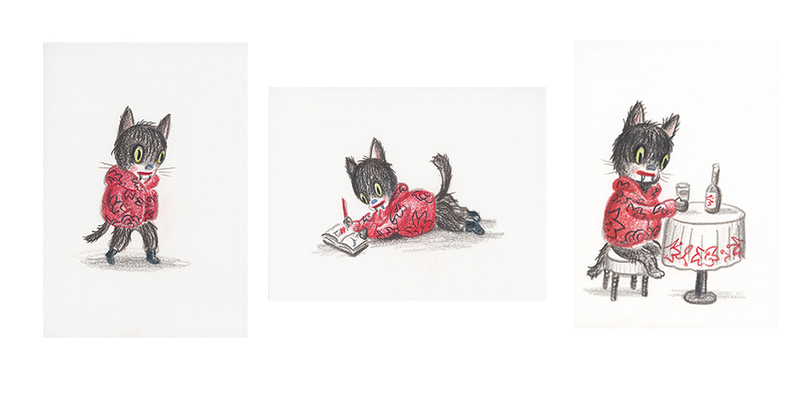 Baseman portrays himself as his companion Blackie the Cat in this sweet and special drawing series made in 2018. A limited amount of all three images from the original print edition of 100, each measuring 5 x 7 inches, was offered as a webstore exclusive on 21 March 2019. Depicting everyday activities, the portraits show the artist walking in contemplation (the original), drawing, and celebrating (aka The Toast). The print series shares Baseman’s desire to live life to its fullest, to be kind and celebrate what’s important.